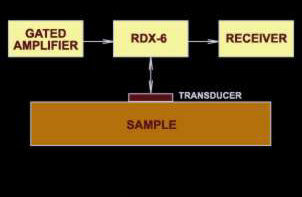 The RDX-6 is a broadband (0.25 to 45 MHz) passive device for allowing a single transducer to be used both for transmitting and receiving sound (pulse-echo). It protects the receiver input from the high power output of a gated amplifier without loading the pulse, and also provides an efficient transfer of signal from the transducer to the receiver. A switch-selectable diode expander at the input of the RDX-6. This is designed to block noise that may be present at the output of the gated amplifier. It is particularly valuable when a non-gated (always on) power amplifier is used. Two switch-selectable high power attenuators (1 and 2 dB) follow the diode expander. Use of these attenuators will improve the signal strength to the receiver if the gated amplifier does not present a low impedance to the circuit during the off time. They are required, however, when the diode expander is in use. Eight selectable high-pass filters to the transducer. These improve recovery time for higher-frequency signals. Adjustable damping on the receiver input. This may be effective in minimizing ringing in the transducer.